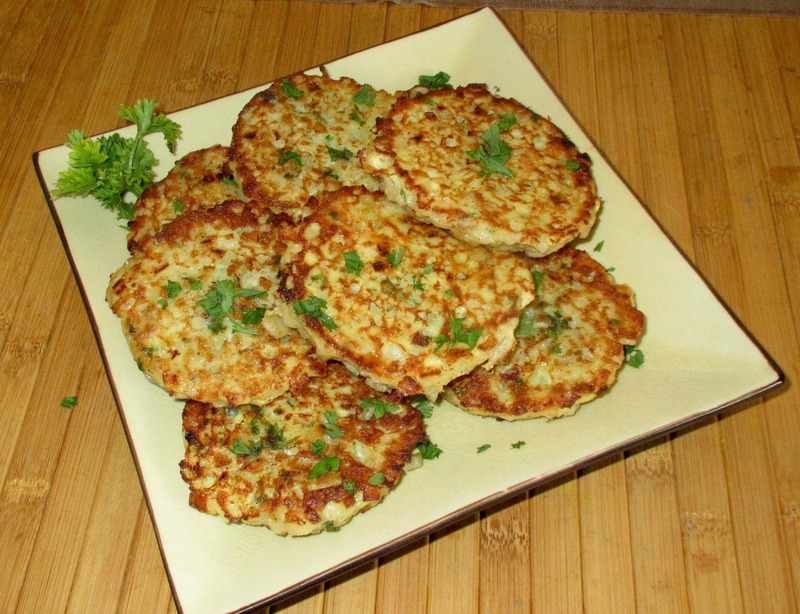 The parsley and celery seed are optional, non-standard ingredients and you can omit them, or add to them as you see fit. 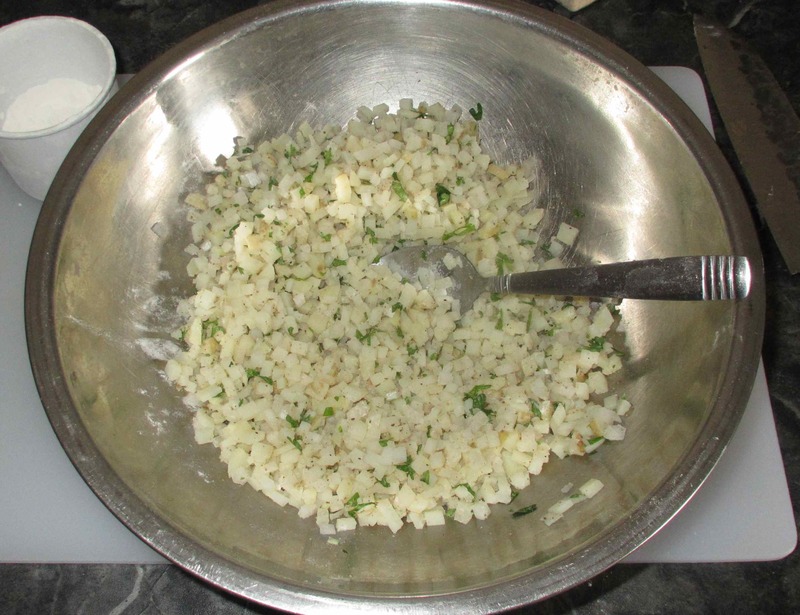 You could, for example, use chopped garlic, other herbs, like thyme or sage, or even get creative and try grated cheese, or chopped tomato. For today, I am keeping things relatively simple. 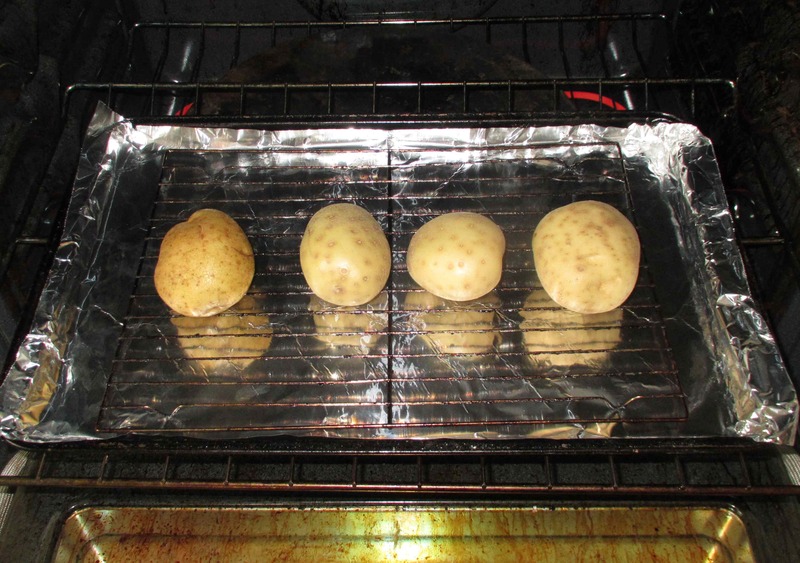 You can pre-cook the potatoes by baking, but be careful not to overdo it. I did these little ones at 325 degrees just to the point that a toothpick penetrated to the center with just a little resistance. The time will depend on the size of the potatoes, but these took about 30 minutes. Basically, you want to cook them to the point that, if you were going to serve them as baked potatoes, you would still need to cook them a little longer to make them completely tender. After baking, slice, and then dice them to small cubes about 4 or 5 millimeters in greatest dimension. Whether or not you peel them is up to you but, if the peel is relatively thin and light-colored, you may wish to leave it on. In this case, I simply cut away the odd blemish and darker areas and left the remainder of the peel in place. 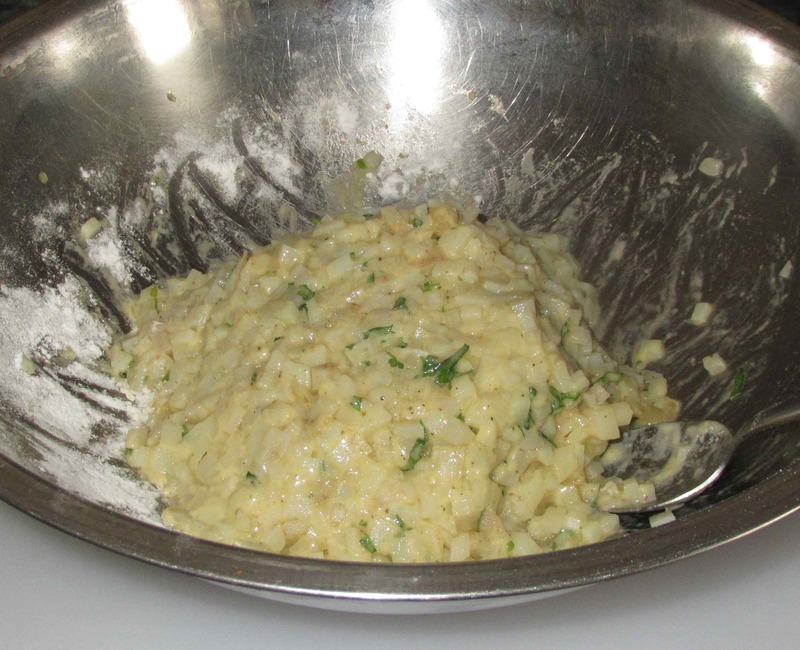 Next, add in the minced onion, parsley and seasonings and about a tablespoon or so of flour, stirring gently to coat the solid ingredients. If you haven’t overcooked the potatoes you should have no problems, otherwise, be very careful so as not to break the dice up into a mush. Now add the beaten eggs, stirring once again, and then stir in additional Flour, a tablespoon at a time until a cohesive mass is formed. The amount of flour will depend on the amount of egg but only 4 or 5 additional tablespoons should be necessary. 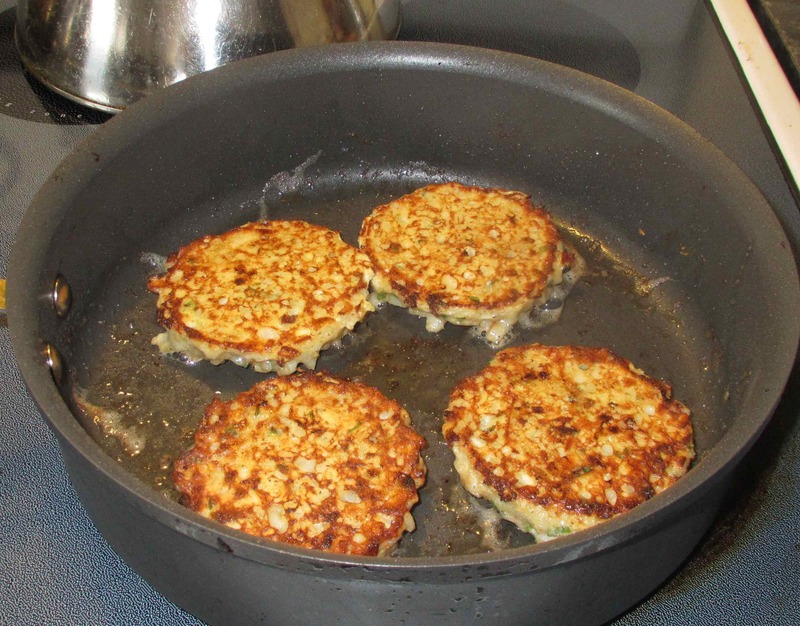 For cooking, you could simply spoon globs of the mix into your cooking fat and press down to form patties but, in order to make nice shapes I am employing a trick I use when doing Latke style potatoes. 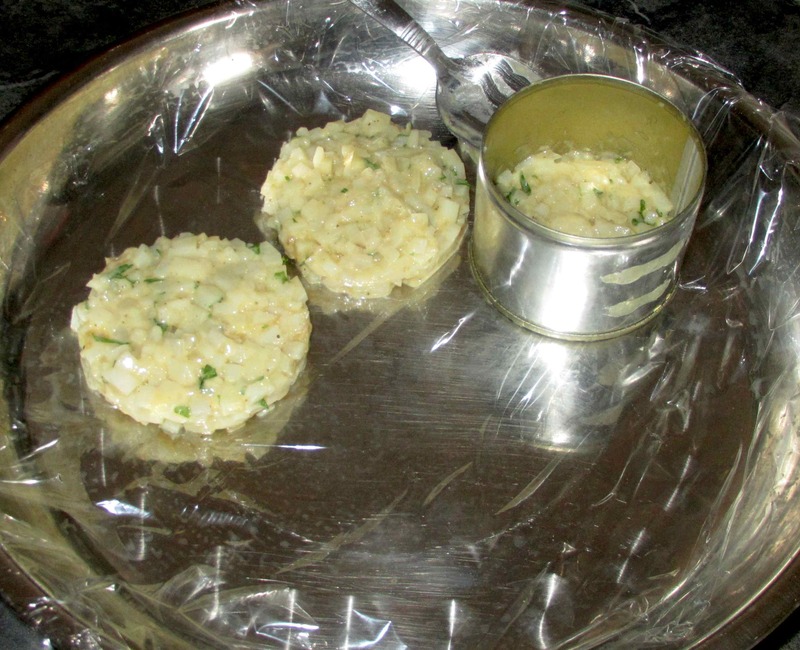 Basically, I use a tin can with the bottom cut out as a mold and form the patties on a sheet of cling wrap. Afterwards, I pop them into the freezer to firm up so that they can be easily handled for frying. The actual frying is straightforward… you simply need to sauté on both sides in oil (I used bacon drippings) until lightly golden. 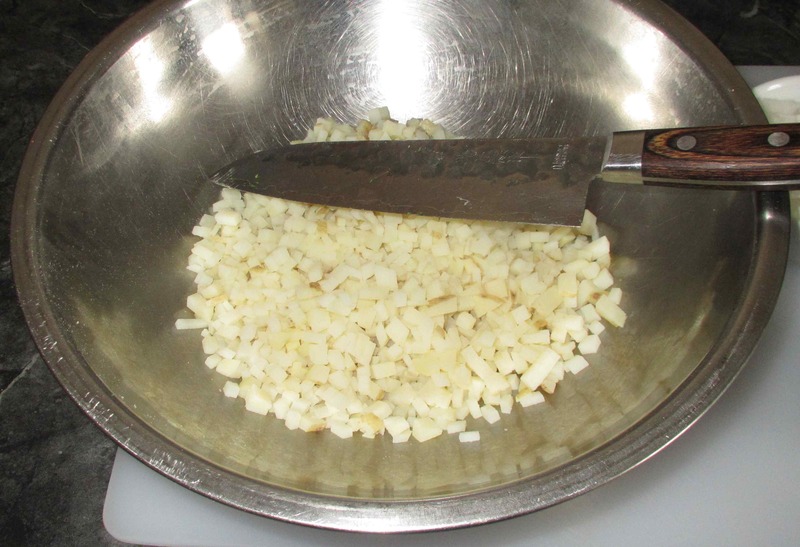 If you have frozen them fairly hard, however, it is a good idea to keep the heat moderately low. When they are done, blot on paper towel and serve while still nice and hot. 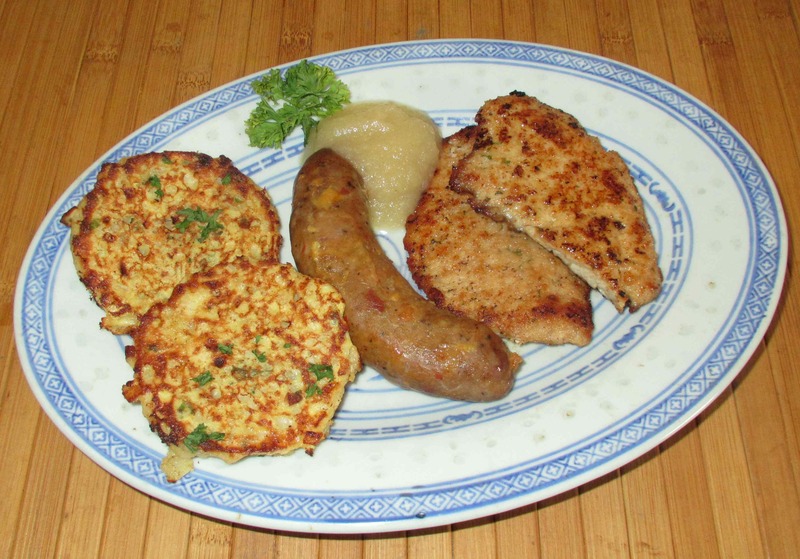 Our brunch consisted of the potato patties along with some breaded pork cutlets with apple sauce and spicy Italian sausage.